On Saturday, April 21st, I found myself driving to San Francisco with a dead squid in the trunk. The squid part wasn’t unusual, since I’m an educator with Squids4Kids. The unusual part was my destination: the San Franscisco Center for the Book. 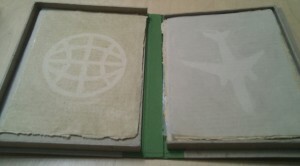 I’ve brought squid to classrooms and summer camps for years, but never to a nonprofit foundation for book arts. The occasion was SFCB’s annual Earth Day Extravaganza, where I oscillated between fielding questions about squid and exploring the center’s current art exhibition, “Left to Chance: In Search of the Accidental Book Art.” In honor of the 100th birthday of avant-garde composer John Cage, the pieces all shared an element of luck or randomness. This may sound weird–but it made me think of science. Could Cage’s emphasis on making people notice their existing environment, along with pieces in “Left to Chance” that made use of natural accidents like sunlight fading paper, be just another manifestation of the scientist’s urge to observe and describe the natural world? Fun fact: Cage himself was an amateur mycologist; his collection of fungi is currently housed at UC Santa Cruz. And then, in the back room, you could print a squid. 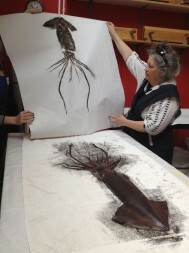 If you’re not familiar with gyotaku, the phrase “squid printing” may conjure peculiar images. Is the squid run through a press? Cut into letter type? Actually, it just sits on a table while visitors line up to roll ink over it. 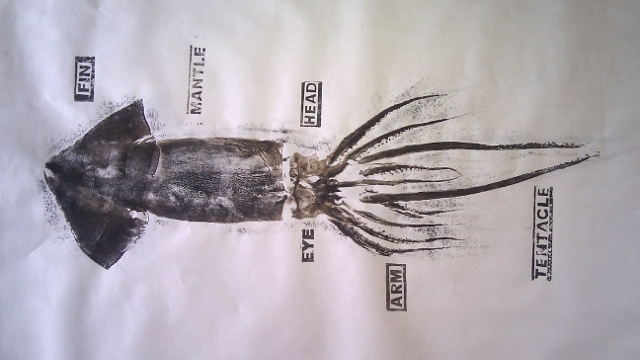 Once the squid has been thoroughly inked and its arms and tentacles artistically arranged, you drop a large piece of paper on top and press it down. Peel the paper off, and you’ve got a squid print. 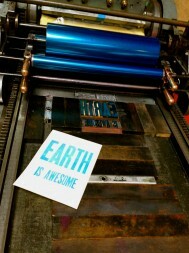 Printmaker Julie Whitcomb has been the activity’s catalyst. Last year she drove to the Squids4Kids lab and picked up the specimen herself. This year I joined the fun solely in my capacity as a science nerd; I have very limited experience with printing. I babbled about ecology while SFCB volunteers guided visitors through the printing process–which included hand-cut stamps to label major parts of the squid’s anatomy. Like all the other visitors, I walked out at the end of the day with a broadside, a book, and a squid print. But I had one more goodie in my bag: when all the printing was done, I had extracted the squid’s statoliths, tiny ear bones that can tell us how old the squid was. It’s my favorite kind of day when science, education, and art all hold hands.